Thanks Alex for the heads up. here is a little background what’s been happening in cleveland: we got the city to donate old tennis courts to us, so we have an “official” bike polo court. we are in the process of building a permanent wall. we are all very excited and have a lot of energy to put towards this. like i said, this is the first tournament we are throwing and want it to be very well down/successful. many of us have been to tournaments in chicago and pittsburgh, and are hoping that there will be a strong representation from other cities at the tournament. 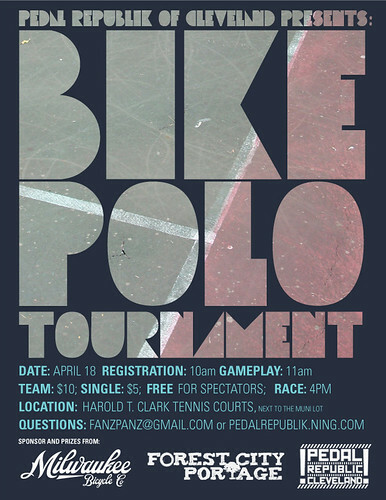 This entry was posted by Doug D on March 12, 2009 at 4:21 pm, and is filled under Bike Polo, Events-Past, Ohio. Follow any responses to this post through RSS 2.0. You can leave a response or trackback from your own site. I don’t know much about bike polo, but I like that it is such an urban kind of sport, or it seems to be transforming into that with this new found popularity. nice job with getting the court. what was the process like? how can other cities follow your lead? i suppose seeking out a derilict court is step one? convincing city officials that putting said court to use and thus allowing the city to appear as though they are promoting active lifestyles is number two? One of our guys found the courts by looking at google maps sat photos. Working with the guys at clevelandbikes.org, I was put in touch with the city’s “bike coordinator” in the parks dept who pretty much talked up the idea and told me to write up a basic proposal.